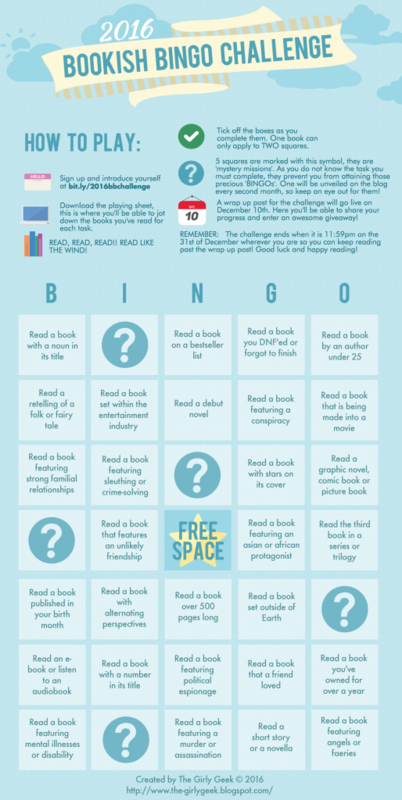 This year, I’ve decided to join the Bookish Bingo Challenge hosted by Maddie of The Girly Geek. If you’re interested to join, check out Maddie’s post. Sign ups are open until November this year so you still have plenty of time. I’ll be tracking down my progress here on a monthly basis. A book with a noun in its title. MYSTERY MISSION #1: Read a book featuring your dream career. A book on a bestseller list. A book you DNF’ed or forgot to finish. A book by an author under 25. A retelling of a folk or fairy tale. A book set within the entertainment industry. A book featuring a conspiracy. A book that is being made into a movie. A book featuring strong familial relationships. A book featuring sleuthing or crime-solving. A book with stars on its cover. A graphic novel, comic book or picture book. A book that features an unlikely friendship. A book featuring an asian or african MC. The third book in a series or trilogy. A book published in your birth month. A book with alternating perspectives. A book over 500 pages long. A book set outside of Earth. An e-book or listen to an audiobook. A book with a number in its title. A book featuring political espionage. A book that a friend loved. A book you’ve owned for over a year. A book featuring mental ilness or disability. A book featuring a murder or assassination. A short story or a novella. A book featuring angels or faeries.